Clean cut have been operating in the Worthing area since 2014 and have built an impressive reputation. The vans have become a familiar sight on the streets of Worthing and the team are well known for doing a first class job and will be a part of the landscape of the town for many years to come. 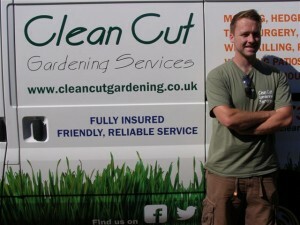 For all your gardening needs look no further than the guys at Clean Cut Worthing. One of the things I have learnt over the years is that clients will come to you with small jobs which to them are important, even though there is not much money in it for you. The important thing is to do the job for them with as much care as if it was urgent, worth a million pounds and that their life depended on it. I asked you to advise about the tiny front garden at 39 North parade which was overgrown and wanted attention. I thought it would need digging-up and re-turfing. You very helpfully advised that it was not necessary to go to such extremes. Instead you said that the grass only needed a good trim, treatment with your special chemicals to kill the dandelions and a general tidy. You did the job just as quickly as you promised. The garden looks much neater now that it was before and you even made the flower beds look good, which was more than I expected. It was not a big job for you but you put your heart and soul into it just as I have always done in the past for my clients and will do in the future. Many thanks for your help. I will have no hesitation in recommending you to my friends, family, colleagues and clients.